Who is Professor Sen?...Prof Amartya Kumar Sen of Shanti-niketan, Delhi School of Economics, Cambridge and Harvard represents the old guard in his (sincere) attempts to bring South Asian Hindus and Muslims together. Now is the age of Hindi-Chini shadow boxing, and the man who is best informed about the thought processes of our Chinese overlords is Prof Tansen Sen of Peking University, University of Pennsylvania and Baruch College. Tansen Sen is the author of Buddhism, Diplomacy, and Trade: The Realignment of Sino-Indian Relations, 600-1400 (University of Hawai'i Press, 2003) and co-author (with Victor H. Mair) of Traditional China in Asian and World History (Association for Asian Studies, 2012). He has edited Buddhism Across Asia: Networks of Material, Cultural and Intellectual Exchange (Institute of Southeast Asian Studies, 2014) and guest-edited special issues of China Report ("Kolkata and China," December 2007; and "Studies on India-China Interactions Dedicated to Ji Xianlin," 2012). With Wang Bangwei he has co-edited India and China: Interactions through Buddhism and Diplomacy: A Collection of Essays by Professor Prabodh Chandra Bagchi (Anthem Press, 2011). While the scholarship is impressive, we confess to be charmed by the name Tansen Sen.
We presume that the good prof is named after [ref. Wiki] Mian Tansen (born 1493 or 1506 as Ramtanu Pandey – died 1586 or 1589 as Tansen) a prominent Hindustani classical music composer, musician and vocalist....He was among the Navaratnas (nine jewels) at the court of the Mughal Emperor Jalal ud-din Akbar. Akbar gave him the title Mian, an honorific, meaning learned man....It was only after the age of 5 that Tansen showed any musical talent....he was a disciple of Swami Haridas, the legendary composer from Vrindavan and part of the stellar Gwalior court of Raja Man Singh Tomar (1486–1516 AD), specializing in the Dhrupad style of singing. His talent was recognised early and it was the ruler of Gwalior who conferred upon the maestro the honorific title 'Tansen'. The romantic concept of a historic Silk Road by which camel caravans wend among the mountains and deserts of Central Asia is back in the news. So is talk on re-establishing the maritime networks by which the Chinese Admiral Zheng He steered his naval armada across the Indian Ocean seven times. China’s leaders promote the ancient trade routes, most recently during the Chinese President Xi Jinping’s visits to countries in Central and South Asia, to emphasize the nation’s historic role as a harbinger of peace and prosperity. In an address at Kazakhstan's Nazarbayev University, calling for cooperation and development of the Eurasian region through this new Silk Road initiative, Xi presented five specific goals: strengthening of economic collaboration, improvement of road connectivity, promotion of trade and investment, facilitation of currency conversion, and bolstering of people-to-people exchanges. A month later, at the 16th ASEAN-China Summit held in Brunei, Chinese Premier Li Keqiang proposed the building of a 21st century “Maritime Silk Road” to jointly foster maritime cooperation, connectivity, scientific and environmental research, and fishery activities. A few days later, in his address to the Indonesian Parliament Xi confirmed this idea and stated that China would devote funds to “vigorously develop maritime partnership in a joint effort to build the Maritime Silk Road of the 21st century,” stretching from coastal China to the Mediterranean Sea. Not mentioned, however, are the backdrops of conflict and the push to spread a Sinocentric world order. In trying to portray the past as a utopian epoch, the purpose of Zhang Qian’s mission to the so-called Western Regions was misrepresented. The Han emperor dispatched Zhang to find an ally to fight the powerful Xiongnu Confederacy, the leading adversary of the Western Han Empire. Because of its expansionist policies, the Han Empire was responsible for transforming the originally nomadic Xiongnu people into a semi-state entity that offered resistance to the Han forces. In 138 BCE the empire sent Zhang to Central Asia to locate the Yuezhi people, previously routed by the Xiongnus. His mission was a failure, however, as he was captured by the Xiongnu and forced to marry a local woman. Escaping after 10 years of captivity, he found that the Yuezhi were not interested in a military alliance. Zhang Qian’s only contribution was to inform the Han court about the polities and people in Central Asia. Similarly, the portrayal of Admiral Zheng He as an agent of peace and friendship is problematic. 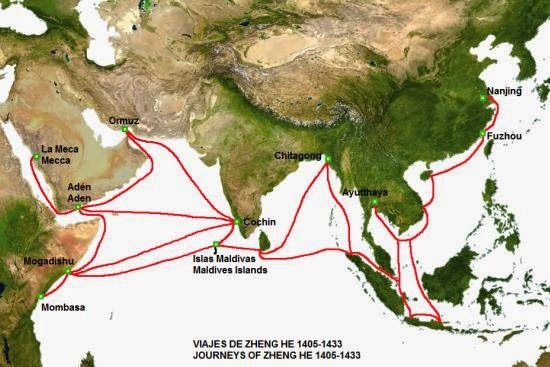 In reality, Zheng’s seven expeditions between 1405 and 1433 included use of military force in what are present-day Indonesia, Malaysia, Sri Lanka and India to install friendly rulers and control strategic chokepoints of the Indian Ocean. He intervened in dynastic politics of Sri Lanka and Indonesia and brought back prisoners to Nanjing, the Ming capital. Ming Emperor Yongle originally dispatched Zheng to the Western seas to look for his nephew whom he had deposed from the throne and to promote the virtues of the Chinese civilization. In the course of these expeditions, Zheng brought back many kings and princes to kowtow to the emperor and exchange gifts. The voyages were abandoned when it turned out to be too expensive and gave excessive power, in the view of the Confucian court officials, to eunuchs such as Zheng He. The Han Empire used similar tactics in Central Asia, especially at strategic locations of the trade routes. Thus neither the overland route nor the maritime channels, termed collectively as the Silk Routes, were peaceful or fostered friendly exchanges through Chinese presence, as modern narratives would suggest. There is also a problem with the term “Silk Road” or “Silk Routes.” German geographer Ferdinand von Richthofen coined the term in 1877 for the ancient overland trade route through Central Asia. Since then, many routes that linked China to the outside world have been called “Silk Roads” or “Silk Routes” despite the fact that silk was neither the earliest nor the most commonly traded commodity on any of these routes. Additionally, the term, enthusiastically employed by Chinese scholars, places unwarranted emphasis on the role of China in pre-modern intra-regional interactions. This comes at the expense of neglecting external influence on Chinese societies and economies throughout the past 2000 years. Perhaps, like many Chinese, Xi’s views about the Silk Roads were shaped by the PRC educational system that prevents critical analysis and proper deconstruction of historical sources. It’s also possible that Xi was genuinely influenced by the fact that his family hails from near the ancient Chinese capital Xi’an, known in history as Chang’an, a place recognized in history books as the starting point of the overland Silk Road. Either the president is unaware of the negative reactions that use of Chinese cultural symbolism in the arena of foreign policy induce among some foreign states or is adamant about pushing these through with the economic muscle China has toned over the past several decades. Several countries are willing to accept these distorted historical narratives for economic reasons. The Sri Lankan government, for example, last year received a gold-plated statue of Zheng as a gift from China's International Tour Management Association. The two sides declared that Zheng He and his expeditions represented ancient commercial and peaceful relations between China and Sri Lanka. Neglected were the details that Zheng had instituted regime change in the region; abducted a local ruler, Alaskawera; and brought him to Nanjing as a prisoner. Zheng also carried off the famous Tooth Relic of the Buddha at Kandy, long a symbol of Sri Lankan political sovereignty. Military conflict also took place in Indonesia, where some local newspapers applauded Xi’s proposals noting that they could bring “enormous opportunities for regional development.” Not of concern was the fact that in Sumatra, in 1407, Zheng had instituted a regime change by abducting a local ethnic Chinese leader named Chen Zuyi, whom the Ming court portrayed as a pirate. After Chen was publicly executed in Nanjing, he was replaced by a person representing the Ming court’s interest in the region. In the same year, Zheng also intervened in the internal affairs of the Majapahit polity in Java, seemingly to weaken the main regional power in Southeast Asia. These military interventions like those in others regions that used the pretext of ushering in a harmonious world order under the Chinese Son of Heaven were objectives of the Zheng He expeditions. The Silk Roads initiative of the Chinese government, with substantial influx of money and investment, could boost the economies of several countries in Asia and Europe that are willing to claim ancient links to the Middle Kingdom. For China, the success of the initiative will open new avenues for investing its vast monetary reserves. It will also mark a major step towards recreating the Chinese world order of the ancient times known as tianxia, that is, all regions of the known world that belonged to the heavenly-mandated emperor of China. This new world order will not be simply rhetorical, but could impose significant geopolitical implications. Tansen Sen, “Changing Regimes: Two Episodes of Chinese Military Interventions in Medieval South Asia.” In Upinder Singh and Parul P. Dhar (Ed. ), Asian Encounters: Exploring Connected Histories. New Delhi: Oxford University Press, forthcoming. Geoff Wade, “Ming China’s Violence against Neighbouring Polities and Its Representations in Chinese Historiography.” In Upinder Singh and Parul P. Dhar (Ed. ), Asian Encounters: Exploring Connected Histories. New Delhi: Oxford University Press, forthcoming.